The objective is to get closer to the appearance of the prototype around the tie bar area whilst retaining as much of the Peco mechanics as possible. Facilitate retrofit of the original mechanics without recourse to glue etc. Note: In the example shown below, 4 bolt cosmetic fishplates were also fitted. An eight part series supporting this How to.. appears in my blog. The offending parts we would like to correct/improve. Cut and fit sleeper infills from plasticard about 2mm thick. Use a liquid plastic glue, not Superglue because if that overflows it could permanently lock the switch blades. 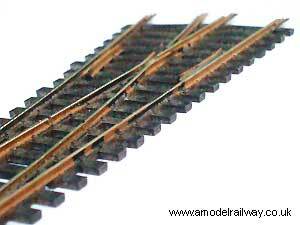 Cut away the non-textured strip at the red line on the large sleepers. 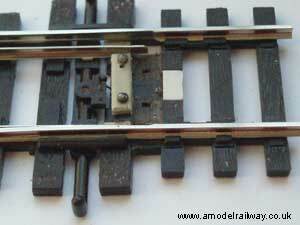 For manual control fill the holes in the sleepers and tiebar with a soft material like wax or putty. This can be poked out if a point motor is fitted in future. If a point motor is to be used now then leave the holes showing. Remove the original spring retaining cover and spring. Make ready the new retaining clip. This will be held in place with Peco track pins that are about 0.64 mm thick (larger than the drilled hole). Do not use pins that are thicker than this. Note the orientation of the spring relative to clip. Set aside the spring. 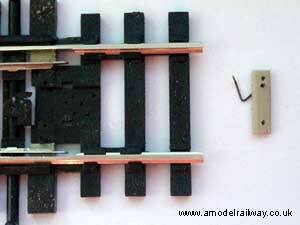 Place clip onto sleeper so that it is central between the outside rails and flush with the dummy sleeper edge. Carefully drill through the two outside clip holes into and through the sleeper. Remove clip. Mount clip on spring via the 2nd hole (shown above). 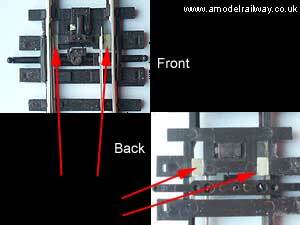 Place assembly onto sleeper ensuring other end of spring is in slot on tiebar. Do not compress spring. Swivel the clip to about 30 degrees so that top holes are aligned and spring still located. Push track pin through. It is an interference fit but the plastic will give a little and hold pin firmly. Swivel clip to align other holes and fit track pin. The spring is compressed. Push pins fully home. Turn over and cut pins flush. Smooth over with a flat file. Check switch blades operate and lock into position. File domed pin heads flatter. 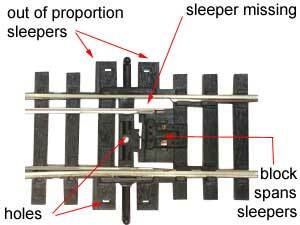 Make the web between the two sleepers flat by whittling away the raised areas at each end with knife, file and/or miniature grinder (dremmel). The web sits below the sleeper tops so that ballast can hide it. It is retained for retrofit. The central recess on the other sleeper is filled with 0.5mm plasticard that is push fit not glued. If you ever want to refit the original clip simply pull out the two track pins, remove clip and prize off the recess flap. Reinstall metal clip, place cover plate in position on spring and bend over clips to hold in place. Wash the turnout in soapy water. 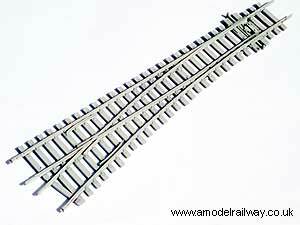 Fit all rail joiners and slip small pieces of rail into each free end for paint masking. 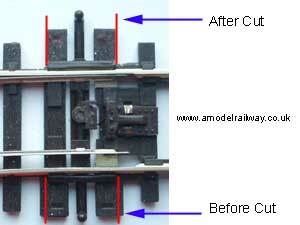 Cut strips from insulation tape and apply to top of rails and fold inside top edge. 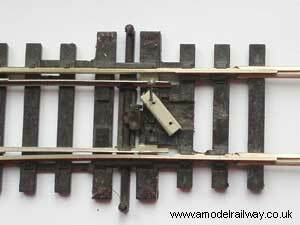 Mask the touching face of stock rail and switch blade. Spray with grey car primer. 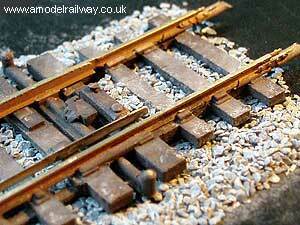 Alternative to masking is wipe rail surfaces immediately after painting or scrape paint away when dry. Spray sleeper colour. I used Humbrol 160 with a little black. 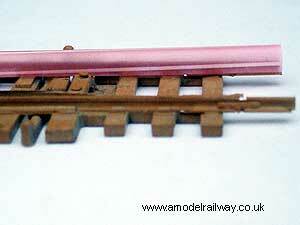 If you remove straw masks whilst sleepers are still wet some colour may wipe onto the rails. This represents general grime and oil that has been deposited by trains. Remove tape and clean away sticky residue left behind. Touch up areas where primer shows. Plasticard , 0.5mm, 1.5mm and 2mm thick. 3rd hole (fixing): On centre line 1.5 mm from bottom edge. Chamfer: top edges a little. Note: If a point motor is used and fails to switch because the spring is too stiff then remake the part with the 2nd hole closer to the right hand side. © Copyright 2008-2019: David Smith.